Wouldnt buy them now out of principle, they keep getting smaller so not even worth the money any more, when I was little my mum would get a tin of these at xmas and they would last for weeks with the whole family sharing them. 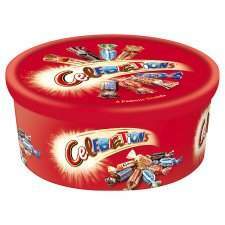 the tin was much bigger and a real treat, now there everywhere on offer all the time they dont seem so special . Are tin eight getting smaller? I thought i t was nearly a kg, now down to 800g. You wait it be like the crisp, and ither things they reduce weight, keep package size the same, and stil charge you same price. These tins are getting so thin they are starting to look like Frisbees! Wouldnt buy them now out of principle, they keep getting smaller so not … Wouldnt buy them now out of principle, they keep getting smaller so not even worth the money any more, when I was little my mum would get a tin of these at xmas and they would last for weeks with the whole family sharing them. the tin was much bigger and a real treat, now there everywhere on offer all the time they dont seem so special . I have an old Quality Street tin I keep bits and bobs in. Contents were 2.18kg (two and a half times bigger than this year's). My kids saw it in the cupboard recently and their jaws dropped. Are tin eight getting smaller? I thought i t was nearly a kg, now down to … Are tin eight getting smaller? I thought i t was nearly a kg, now down to 800g. You wait it be like the crisp, and ither things they reduce weight, keep package size the same, and stil charge you same price. I have an old Quality Street tin I keep bits and bobs in. Contents were … I have an old Quality Street tin I keep bits and bobs in. Contents were 2.18kg (two and a half times bigger than this year's). My kids saw it in the cupboard recently and their jaws dropped. Beats me. google translate was no help. Can anyone remember how much the tins cost in the 70s/80s? Those 2kg+ tins were special size and the current ones should not be compared with them. It has shrunk from 1.2kg to 0.8kg which is still 33% reduction in just 5 years. At least they are not artificially inflating the price to £10 like last year yet. But you wait next month Tesco will have these at £8 buy one get one free. Those 2kg+ tins were special size and the current ones should not be … Those 2kg+ tins were special size and the current ones should not be compared with them. It has shrunk from 1.2kg to 0.8kg which is still 33% reduction in just 5 years. Nope. My tin comes from the 1970s when they REALLY were that size as standard. The 'special size' editions were later ones that were commemorating how they used to be. Nope. My tin comes from the 1970s when they REALLY were that size as … Nope. My tin comes from the 1970s when they REALLY were that size as standard. The 'special size' editions were later ones that were commemorating how they used to be. Thanks OP these are handy for the kids class rather than a present each! But i have to agree they are getting smaller and smaller Would buy some for my home to put away but I know they will be eaten before Nov! Considering the fact they halved the tin, price should £2.50! Quality Street have gone down 145g and Celebrations, Roses and Heroes are the same size. 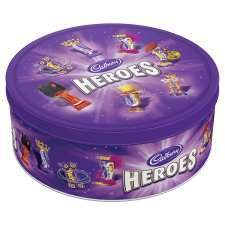 Might buy a tin of heroes, staying well away from the quality street that has shrunk by nearly 15%! Asda seem to sell an 800g one, Tesco claim to be selling a 950g one. even penguins look big, compared to these tins,,and if penguins get any smaller ile mistake em for a postage stamp??? frisbee is a great word for these so called tins. used to be 2.5kg these tins for 4 or 5 quid. I'd rather they put the price up than use devious and dishonest practices like this. Cold. 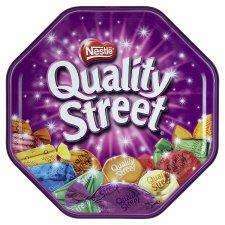 On Tesco site states Quality Street Tin 820G Including Wraps!!! so how much without wraps!! Least thy ain't claiming the usuall bull of better than half price. … Least thy ain't claiming the usuall bull of better than half price. (saying thy were £10 originally) Might buy a tin of heroes, staying well away from the quality street that has shrunk by nearly 15%! Nestlé are just following in Cadbury and Mars' footsteps now. Roses reduced to 850g last year. Half are delicious - half are minging. Label on shelf instore says weight is 800g. 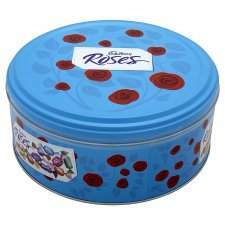 We bought a tin of roses last night - I wouldn't let my hubby buy the heroes as the weight of the tin was lighter than the roses. Nestlé are just following in Cadbury and Mars' footsteps now. Roses … Nestlé are just following in Cadbury and Mars' footsteps now. Roses reduced to 850g last year. I thought Nestle made these? Why buy then? Thou thanks for sharing your personal preferance, atleast we all know what not to get you at xmas. They do. I was meaning that Cadbury Roses reduced the weight last year and this year Nestle Quality Street have done similar. They do. I was meaning that Cadbury Roses reduced the weight last year … They do. I was meaning that Cadbury Roses reduced the weight last year and this year Nestle Quality Street have done similar.